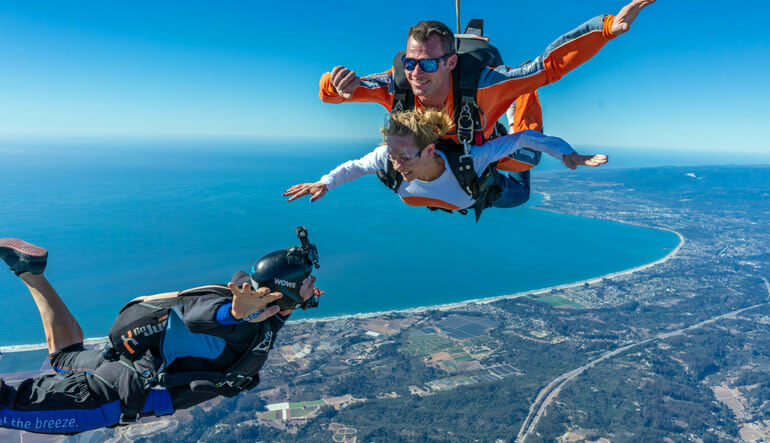 The big benefit of this Santa Cruz skydive is the scenery. No other tandem skydiving experience in the Golden State awards you with vistas like these! Just 90 minutes out from San Francisco (and 45 minutes from San Jose) awaits the most hair-raising adventure you’ll ever embark on. But the big benefit of this Santa Cruz skydive isn’t its nifty location. It’s the scenery. No other tandem skydiving experience in the Golden State awards you with vistas like these! 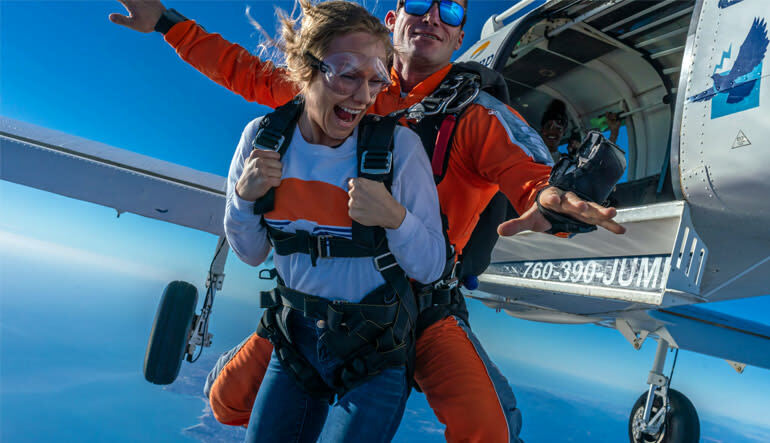 From 13,000 feet in the air, you’ll be treated to ocean views that are absolutely unrivaled. Just picture yourself succumbing to gravity for a 35-second freefall (it’s okay to get a little weak in the knees just thinking about it). You’re reaching speeds of up to 120mph when, suddenly, the chute deploys and it’s just you and your tandem diver caught in a calm drift back to earth. You’re surrounded by views of the Pacific, Monterey Bay, the Beach Boardwalk and other delicious eye candy. Aren’t you glad you had the nerve to get up here? 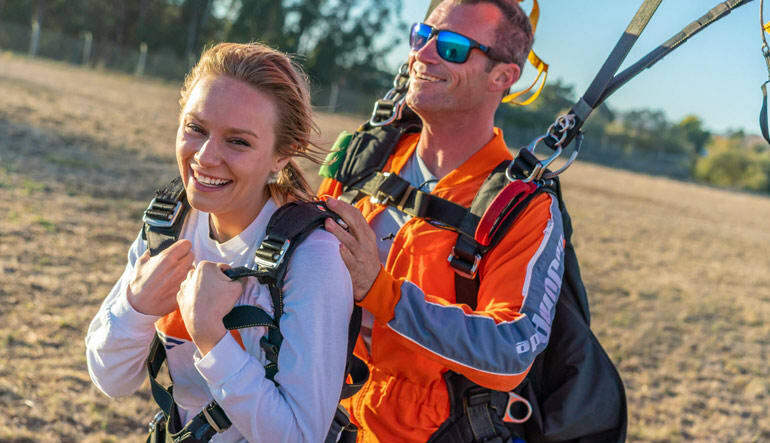 Go tandem skydiving, Santa Cruz style! No experience required: a quick brief and you’re ready to launch! Ascend 13,000 feet and marvel at the ocean views from the safety of the cabin. Want a closer look? Proceed with your tandem jumper to the open door! This is it! There’s nothing but you, blue skies and the force of gravity! Freefall for a little under a minute (for many, it feels like a lifetime). Deploy the chute—you did it, you’ve officially jumped out of an airplane! The next part’s easy: appreciate all the bayside scenery on your drift back to earth. Touch down, catch your breath and think of all the bragging rights you’ve earned. With this tandem skydive, you can expect tiptop scenery, a friendly staff that’ll keep you at ease and a spotless safety record. 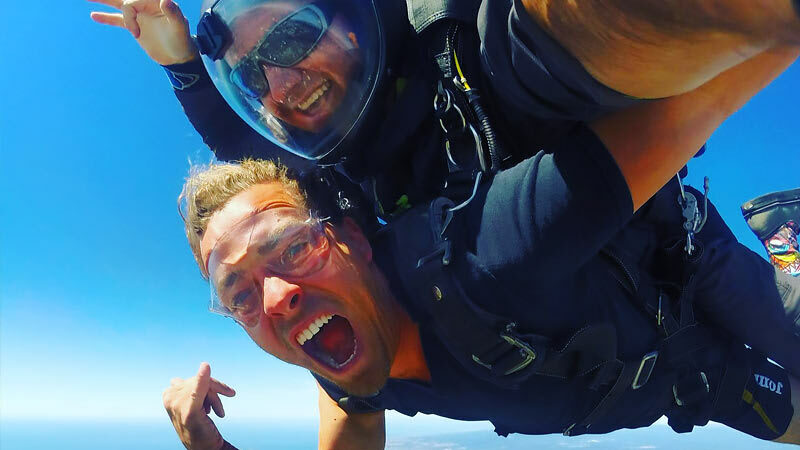 You only take your first skydive once, so make it count. Book this life-changing experience today!